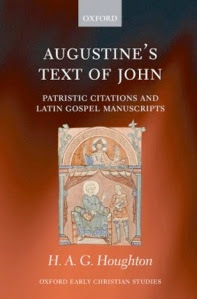 Recently the RBECS (Reviews of Biblical and Early Christian Studies) blog published two reviews of H. A. G. Houghton Augustine’s Text of John. Patristic Citations and Latin Gospel Manuscripts (Oxford: OUP, 2008) written by Dan Batovici, Peterhouse, University of Cambridge (here), and J. Cornelia Linde, Department of History, University College London (here). RBECS has also published Houghton's response (here). The reviews and the author's response were first presented in a review-session dedicated to Houghton’s monograph at the International Medieval Congress, Leeds, July 2010,(session 1630). Update: Hugh Houghton's monograph is also featured on the new Biblindex blog, which also refers to the bookreview by Craig R. Koester in Review of Biblical Literature. Strange how helpful a book as carefully written as this can be, even to seemingly unrelated research. I am working on Didymus the Blind's biblical citations in the his lectures on the Psalms, and found it very enlightening, esp. p.65 (with its discussion of Chains of citations, and ref,. to Nico Knauer's book on Psalmenzitaten); and p. 68, discussing the recasting of citations acc. to rhetorical considerations.